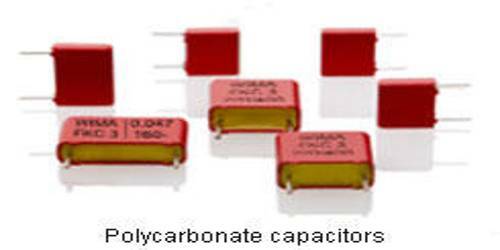 The polycarbonate capacitor has been available for many years. The polycarbonate dielectric material is very stable having a high tolerance and can operate at a temperature of the range of typically -55°C to +125°C without de-rating. Additionally, the insulation resistance and dissipation factor are good and the dielectric constant means that polycarbonate capacitors are a reasonable size for their capacitance. 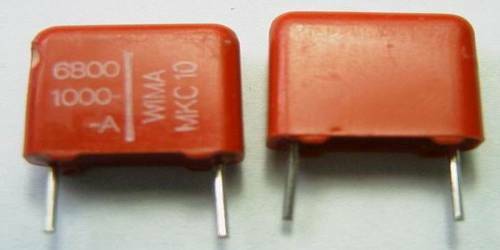 While polycarbonate capacitors have been widely used within many electronics circuits and found favor with many electronics design centers, they are not as widely used these days. The Bayer Corporation which manufactures the majority of polycarbonate announced in 2000 that it was to discontinue production of the dielectric film used in these capacitors. Although many saw this as the end of polycarbonate capacitors, there are still some smaller sources of the dielectric material and some capacitors are still made. However many are cautious about using polycarbonate capacitors in new electronics designs as there are fewer suppliers, and relying on a single source for the long-term supply of an electronic component is not wise. Polycarbonates are a group of thermoplastic polymers which find uses in many areas of industry as they are easily molded and thermoformed. They also possess a number of useful features in that they are temperature resistant impact resistant (virtually bullet-roof). They can also be used for vandal-proof glazing. Polycarbonate is also used in capacitors as a dielectric. Polycarbonate is very stable, offering the possibility of high tolerance capacitors that can be used over a wide temperature range, and shows little sign of aging. Of this polyphenylene sulphide, PPS is being widely used in many areas as an almost direct replacement. Polyphenylene sulphide, PPS has many of the same characteristics of polycarbonate and can be often be used as a direct replacement. It has to gain a variety of MIL standards and as such, it is being used in many high specification applications. PPS has been found to have a superior temperature performance both in terms of the temperature range applicable and the temperature coefficient. It is found that polyphenylene sulphide, PPS, and polycarbonate have the almost the same dielectric constant. This means that the size of equivalent capacitors will be virtually the same, making replacement in existing designs much easier. Unfortunately, not all capacitors will be able to be made exactly the same size because PPS and polycarbonate are not available in the same thicknesses.